Quinoa Tabbouleh & Fairy Tale Eggplants Fill 1 Created with Sketch. Blue Apron Chefs, it’s story time. 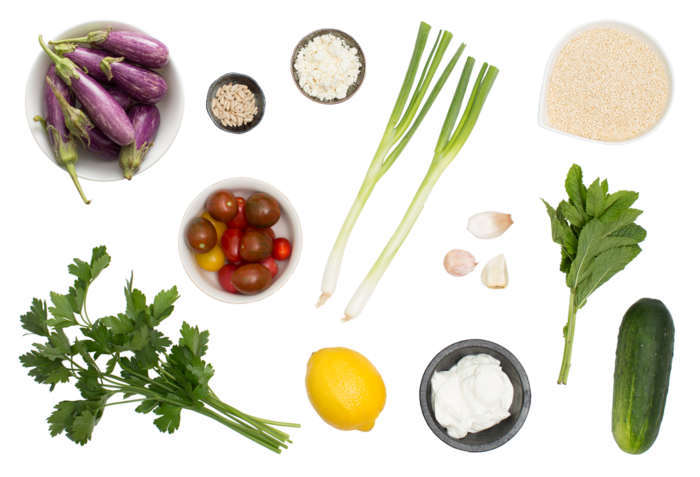 This one begins with a very special variety of eggplant: fairy tale eggplant. Named for their "fairy-scale" size, these teardrop-shaped vegetables are almost too good to be true. Their flesh is mild and tender and their skin is a gorgeous, pale purple stippled with white. Served with toasty pine nuts, hearty tabbouleh and a zesty Greek yogurt sauce, we think you’ll find this dish, well, enchanting. Heat a medium pot of salted water to boiling on high. Once boiling, add the quinoa and cook 15 to 17 minutes, or until tender. Using a fine strainer, drain thoroughly. 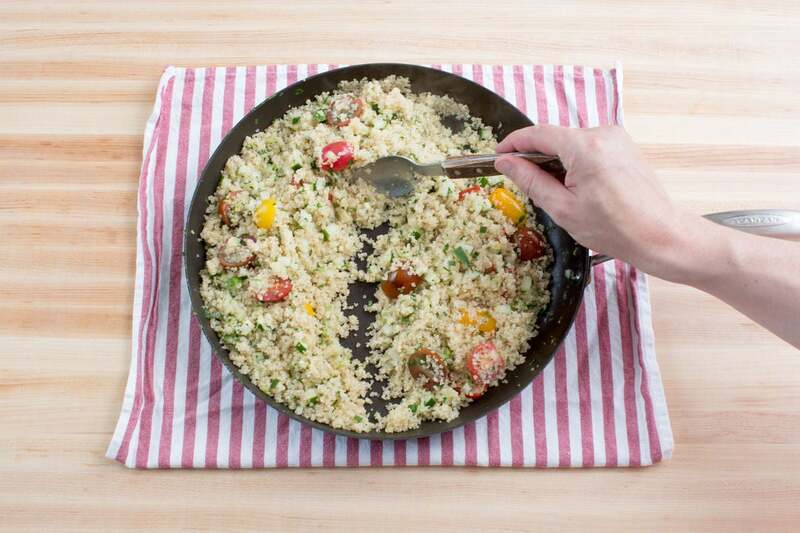 Set the cooked quinoa aside as you continue cooking. 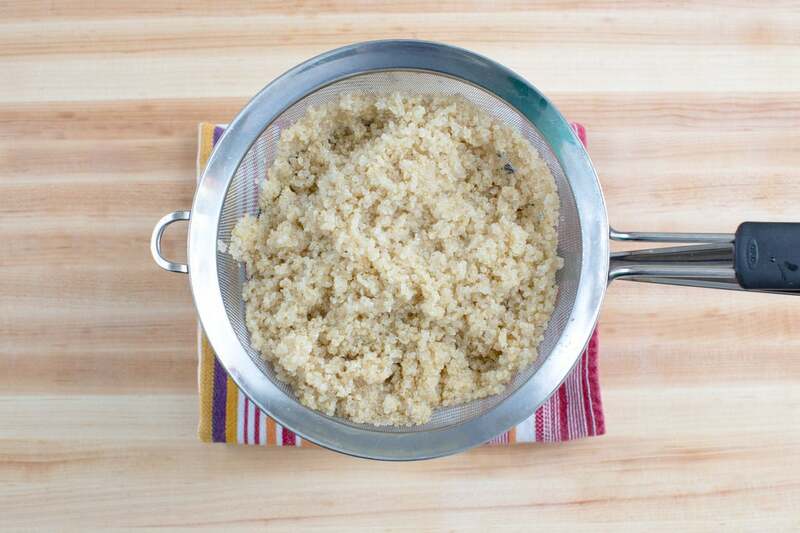 While the quinoa cooks, wash and dry the fresh produce. Slice the tomatoes and eggplants in half. Peel all 3 garlic cloves; mince 2. Mince the remaining clove; then, using the flat side of your knife, smash until it resembles a paste. Remove and discard the roots of the scallions; thinly slice the scallions, separating the white and green parts. Pick the mint and parsley leaves off the stems; discard the stems. Roughly chop the mint and parsley, keeping the 2 herbs separate. Small dice the cucumber. Using a peeler, remove the yellow rind of the lemon, avoiding the pith; mince the rind to get 2 teaspoons of zest. Quarter the lemon and remove the seeds. Heat a large, dry pan (nonstick, if you have one) on medium-high until hot. 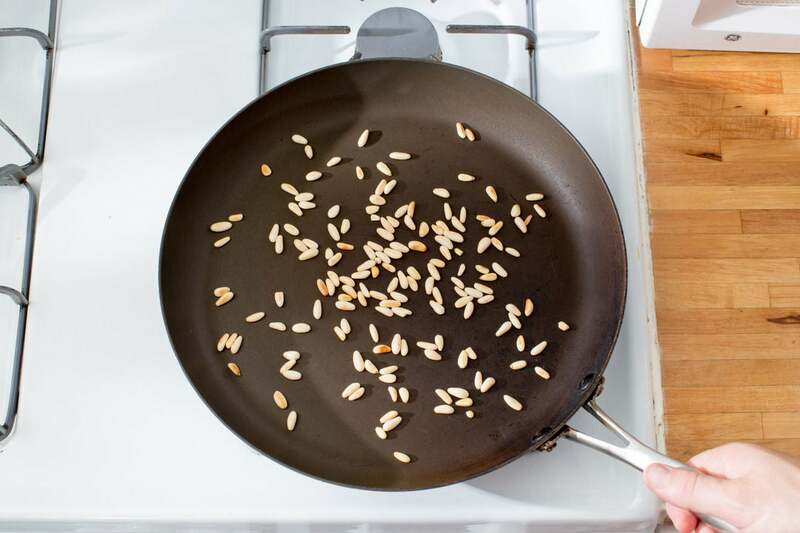 Add the pine nuts and toast, stirring frequently, 2 to 4 minutes, or until browned and fragrant. Transfer to a small bowl. 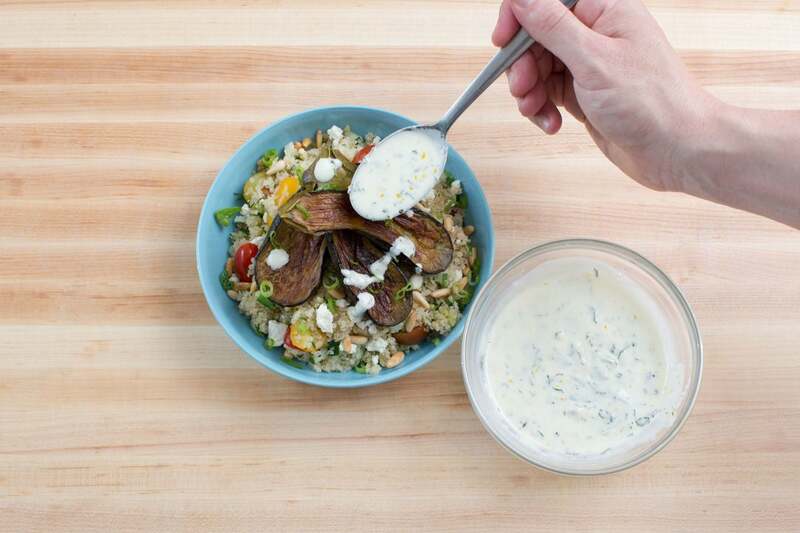 To make the yogurt sauce, combine the Greek yogurt, lemon zest, garlic paste and mint in a small bowl. Stir in a drizzle of olive oil and season with salt and pepper to taste. In a medium bowl, toss the eggplants with a drizzle of olive oil and season with salt and pepper. In the same pan used to toast the nuts, heat 2 teaspoons of olive oil on medium until hot. Add the eggplants, cut side down first, and cook 2 to 3 minutes per side, or until browned and tender. Transfer to a plate and set aside in a warm place. Wipe out the pan. 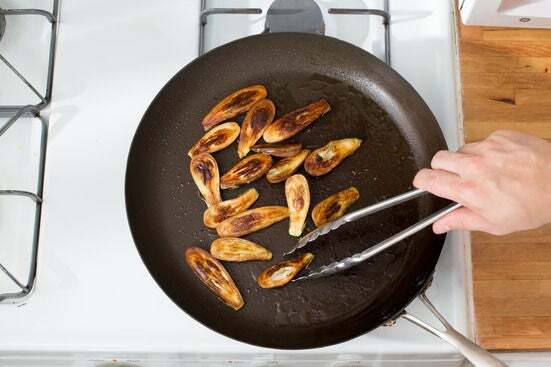 In the same pan used to cook the eggplants, heat 2 teaspoons of olive oil on medium until hot. Add the minced garlic and white parts of the scallions. Cook, stirring frequently, 30 seconds to 1 minute, or until fragrant. Add the cooked quinoa, parsley and the juice of 2 lemon wedges; season with salt and pepper. Cook, stirring occasionally, 2 to 3 minutes, or until well combined and heated through. Remove from heat and stir in the tomatoes and cucumber; season with salt and pepper to taste. 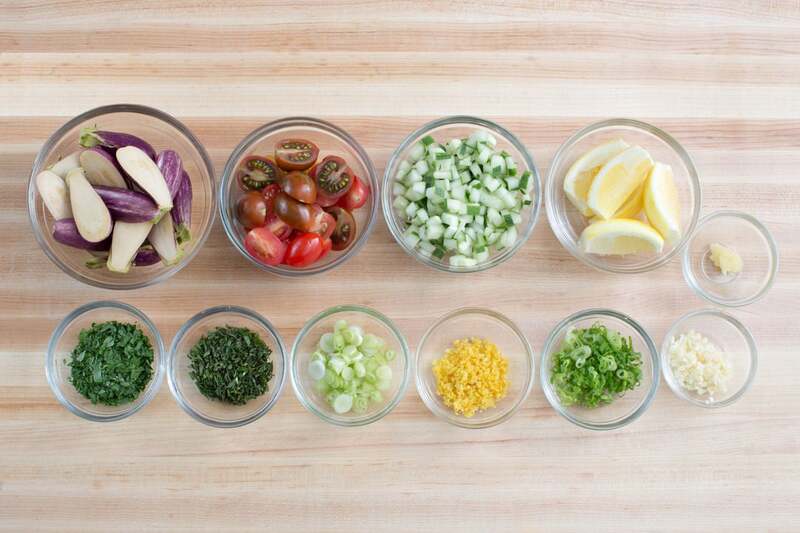 Divide the tabbouleh between 2 dishes. 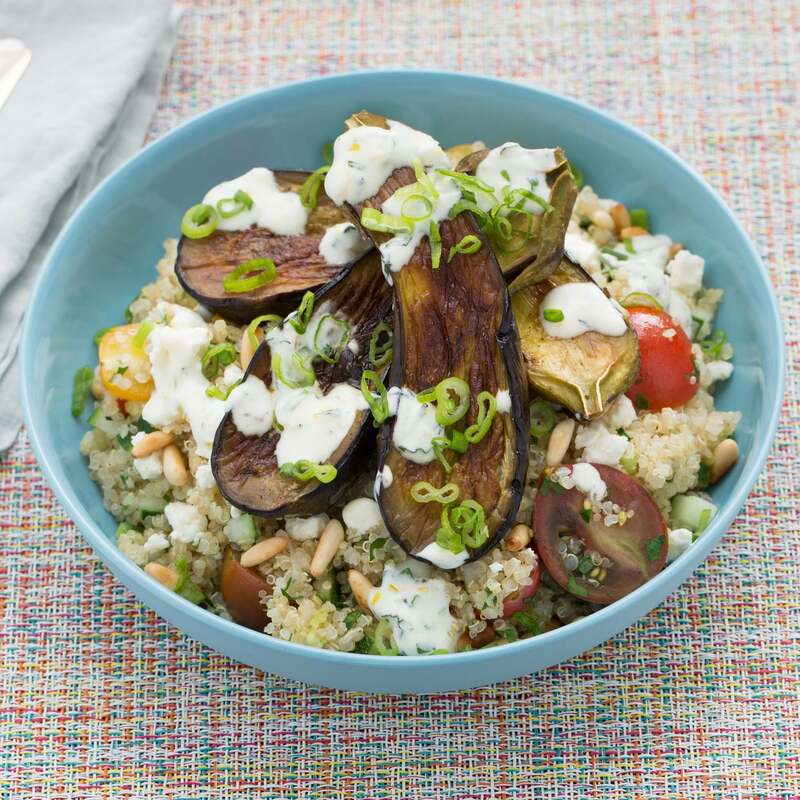 Top each with the cooked eggplants, toasted pine nuts and feta cheese. Garnish with the yogurt sauce, green parts of the scallions and the remaining lemon wedges. Enjoy!